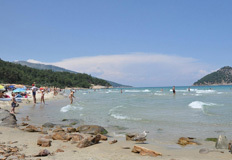 ASTIR NOTOS hotel is located in the most touristic village of Thassos, Potos. 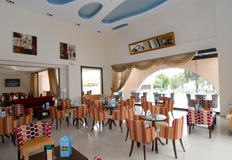 A modern, stylish 4 * hotel, in operation since 2008, will satisfy you completely with its integrated services. Built in an ideal location, just 250m from the beach and a similar distance from the center of the village will make you forget your car! Its particular architecture, the superb interior design with 20 different room models, its high-quality service and the warm, friendly atmosphere will make you love it! NOTOS DELUXE SUITES is the brand-new section of ASTIR NOTOS HOTEL. Situated just 40m away from ASTIR NOTOS MAIN, will operate first time on the 28th of APRIL 2016. 14 spacious, luxurious, one-bedroom Suites, settled in 4 buildings and being all ground-floor (just one on 2nd floor) offer a huge terrace with Living and direct access to the gardens. An excellent choice for guests that wish to combine Innovative interior design and personal relaxing atmosphere with great proximity to POTOS downtown. Astir Notos Hotel is located in Potos , on the south coast of the island, the area with the most beautiful and known beaches of the island . 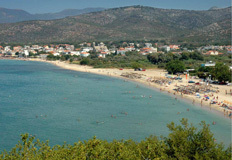 Potos , being the most known resort of the island , attracts every year the majority of the island visitors. The stylish, unique architecture combinable with the impressive Interior design of 20 different models create a unique result. Just 3 minutes walk to the village . Our guests can get to the centre and back many times per day . No necessity for a car. Just 29 rooms. Warm & friendly. Here, every Guest is not just a number. We care about you.